Hey team Marketing! Thanks for the warm welcome and for a lot of good conversations over the last week. A couple of things became clear to me as I was discussing with everyone, so I’m going to dive right in and make some changes. We’re all working in different time zones and on different schedules, so it’s hard to always attend the weekly meeting. That’s why we’re going to try and have posts on this Make Marketing blog for every project and consolidate feedback there, instead of trying to discuss and decide everything in a weekly meeting. The meetings should mostly be to discuss blockers and to help projects move forward. Projects will sometimes be small, and sometimes they will be bigger. If they’re bigger we’ll form working groups. Those working groups can call their own meetings but are asked to have them in the #marketing channel so everyone can read along if they want to. For the weekly meetings, we’re going to ask for “check-ins” from the different projects. This makes it so you don’t have to be there yourself if you can’t be: you just send our meeting coordinator for that meeting a few lines of how it’s going. If you need help unblocking anything, please put that in there too. This is perhaps the most unfortunate for some people that are used to the current meeting time, but we’re going to have to change it. Even though the importance of attending has lessened with the changes above, I’d still really like to participate every week, and the current time slot makes that impossible for me as I have family duties at that time. Our meeting coordinator will try to find a new time that works for most people involved. Siobhan Cunningham (@siobhanseija on Slack) will be our meeting coordinator and will (as she did in recent history) chair our meetings too. When she’s not there, she will ask someone else to take over that task from her that week. We’re celebrating a successful contributorsday at WCTessaloniki, last weekend, and look forward to learning more about what was accomplished after the Holidays. Due to Christmas holidays the marketing team has decided to take a break and skip the meetings for 26th December 2018 and 2nd January 2019. We will resume from the second Wednesday of January which is the 9th. @siobhanseija: Our blog on subtitling WPTV videos was published 1.5 weeks ago at https://make.wordpress.org/marketing/2018/11/29/these-videos-need-subtitling-and-you-can-help/. It was fun to see it being shared quite a lot and getting a few lovely comments from people that appreciate the effort. Thanks for sharing team! @siobhanseija: Another blog was published just before WCUS, a video roundup. These are three videos from WPTV that help you get started with contributing to WordPress. Find it here: https://make.wordpress.org/marketing/2018/12/05/video-roundup-how-to-contribute-to-wordpress/. It could use some more sharing! Also, we’ll try to take it along when working on the plan for first-time contributors. @harryjackson1221: For case studies, we need to have some help from the team spreading the word. The link to the form is here: https://docs.google.com/forms/d/e/1FAIpQLSe9cYQRDtJCcI1nphPTfO_Lb7qAGJP68l0_ceyj0uMNzOwI2g/viewform. Here is an example of how I am sharing it on social media. @abhanonstopnewsuk: Social media plan doc — images readded in the requested link style. Thanks to @Sandra for help. The document is back in Bridget’s queue. All questions on links from @mcdwayne and Bridget added. @harryjackson1221: The Rolling Stone Case Study card is not being moved to the Done list since there are still items that need to be completed. I have to post it on the Showcase before moving it. @miker: https://trello.com/c/V7dAnfne/220-5-for-the-future-email-template-for-contributors-to-use-to-approach-their-company. I am negligent in updating this, but we made substantial progress on it at WCUS. We have sufficient copy, and a plan, but I still need to physically turn it into an email. I am updating the due date on this to next week, and will have that draft completed then. @abhanonstopnewsuk: From WordCamp Milano Contributor Day. @Max has started a draft blog on ‘why someone should contribute to WordPress’. He has had input in from a number of other contributors and some feedback/fact checking has now been received. I am working with him on this and we are setting up the Trello card. We are aiming to have this ready for the first edit by next week’s meeting. @abhanonstopnewsuk: Request from WP&UP Charity if we can promote its mental health campaign in the WordPress community which has started this month with DecemBuddies (@gidgey has been featured already), will have a survey in Jan and the main campaign in February. Some pointers are being drafted and will be shared with marketing if it is felt this is something that can be promoted on Make WordPress Marketing. @abhanonstopnewsuk: There is a new sustainability channel being set up by WordCamp organizers and with the community. A draft blog submission to get some help from marketing to promote this. There are questions for the community team on the link to use for the channel so that organizers in other countries can access it. Once they have this, a draft submission will be added to a Trello. @daveloodts: I mentioned this idea of an ‘adopt-a-volunteer’-campaign; or ‘sponsor-a-volunteer’ in this post: https://make.wordpress.org/marketing/2018/12/09/why-your-company-should-contribute-to-wordpress/. Don’t know if #marketing is the place to be or #community. I see it as marketing the community. @miker: https://trello.com/c/IkToXlnz/225-wcus-2018-contributor-day-recap. This would be a great opportunity for a new contributor! This card is for a blog post that will highlight the successes from the WCUS contributor day. The community team also publishes what was accomplished. However, I think we should do a marketing post as well. We spoke a lot about the Five for the Future (FFTF) initiative, and posts like this that show what can be accomplished through contributions are important. @miker: I have one other thing to share from WCUS! We had a number of conversations with different hosts and the Hosting Community team. (Thanks to @Breann McDede and others for participating!). The main takeaway was a strategy to improve our communication with the Hosting Community through more regular direct updates with that team. Using the Gutenberg rollout as an example, the consensus is that it would be useful to have a more formal and defined communication loop. So we are getting direct feedback about what their users are asking, and the types of things they would like to have to distribute to their customers about WordPress. This being said, I will make an effort next year to attend that group as well. The main objective is to establish a communication loop, so we can be more targeted and responsive when creating time-sensitive content. NOTE: Due to Christmas holidays the marketing team has decided to take a break and skip the meetings for 26th December 2018 and 2nd January 2019. We will resume from the second Wednesday of January which is the 9th. The formal announcement will be made by @siobhanseija in the next week’s meeting. Till then happy holidays folks! @gidgey finished one of the 3 docs linked. As a team we discussed the next steps needed for the remaining 2 docs, to help others get started with the work needed. This case study was presented to the group as a way for newcomers to get involved easily. @harryjackson1221 advised the doc is laid out with the headings and submission, needing that to be converted to copy. @coachbirgit brought up a proposal to have a low barrier for all local contributors in their native language but under the hood of the global project structure. This was helpful to the group because some in Marketing were not aware of the http://dewp.slack.com/ instance, so it brought visibility to how some of the other local teams are operating. @coachbirgit and @phil were both made Trello admins to help get this proposal up and running, and allow for the local team to have communication with the make.wordpress.org Marketing team. @miker created a draft policy on fundraising for the Marketing Team and moved the card to Needs Approval for inclusion in the handbook. Bridget approved it and moved it to the needs publishing column. We finished the meeting with some WordCamp US Idea brainstorming for Contributor Day (CD). @gidgey would like to see some more case studies submitted and worked on. We also want to avoid items that cannot be completed during CD which will allow us to achieve some wins. @mcdwayne proposed creating tweets about the work other teams are doing, and Instagram. @harryjackson1221 proposed having some canned blurbs for social media sharing set up prior to the WordCamp. @Jenblogs4u proposed finishing the polyglots infographic we have been working on. @abhanonstopnewsuk asked if the needed steps could be added, as it is not clear what is needed still for the infographic project, and @jenblogs4u suggested breaking it up into bits that can be worked on one page at a time. @abhanonstopnewsuk provided a suggestion for working on interviews with WordPressers for our blog. Overall, it was a great meeting, and we look forward to speaking with you at the next. If you are interested, meet us in #marketing https://wordpress.slack.com/messages/C0GKJ7TFA. First, we discussed the new format our meetings will use, to ensure we are spending less time on going through cards, and more time assisting with onboarding and the work done in the last week. @mcdwayne mentioned the new, improved meeting style he proposed last week. 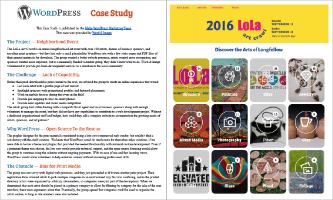 We have a few Case Studies that can use some love. There is a case study in progress and a few over in the To Do column. These are making decent progress. There are also a few that need more info, such as the Studio Z, Pragmatic Web and 34sp.com cards in To Do. This case study has quite a bit of content and is at about 90%, but could use some more tidying up if anyone wants to hop in and help; The next milestone will be passing off to @gidgey and @mcdwayne for peer review and an editorial pass. I have added a checklist to the card to help keep track of this. We are working to finalize the second round of edits, to pass off to @gidgey and @mcdwayne for a final pass. Task Lead: NO ONE! YET! This is an opportunity for someone :new: to own a task; The milestones will be outlined in a checklist on the card. We need to review the submission, write copy to fit the outline on the doc based on the submission and make some content suggestions. We may need to reach out to the party that submitted to get additional content, I can do that if need be. The second milestone will be a peer review/editorial pass. The third milestone is the second round of edits, then finalize it to move over for a final pass by @gidgey/@mcdwayne. A screenshot, publishing on the marketing blog and submission to the WordPress.org showcase are the final milestones. @chanthaboune dropped by to let us know this page is ready to publish. There was a discussion of writing a post to help promote Gutenberg. @westcounty.media had some questions about getting a card get moved from “Wishlist” to “To-Do”. The discussion came down to creating a new card and having a video created to help promote WordPress as a whole. @miker: This has stalled for months, although we should be able to run surveys on any page as a group. We should be able to propose, implement, and then evaluate our own surveys as a group. @chanthaboune shared the Trac ticket related to this request: https://meta.trac.wordpress.org/ticket/3865#ticket. Here in #marketing, we are going to be changing how we define “Objectives” on trello cards moving ahead. If you want to create and work on a new card, that is awesome, or you can take a old card from Wishlist or the Backlog and revive it. The card will need a task lead who will report on the status and make sure we are getting the thing done. An Objective that spells out why we are doing the task. A “Done = X” statement that shows what the final deliverable will be (like Published blog post” or “PDF delivered to group y” – There should also be a checklist associated with the milestones to reach that point. A timeline that makes sense if you had to do the whole card yourself. Nothing wrong with a longer timeline or a shorter one, just should make sense for the card objective and done statement. Our vision for the Marketing Team is to be the go-to resource on strategy and content for other WordPress teams. @bridgetwillard asked for clarification of expectations – watch, approve and upload to WCTV? @maedahbatool suggested an introductory teaser video. @jenblogs4u affirmed that she intended the videos to be serialized, containing several clips each adding @tashan will help with edits. @mcdwayne brought up https://trello.com/c/J6zBc7gJ/46-why-wordpress-for-developers headed by @bridgetwillard and @maedahbatool (and asked that the project be listed with a singe task-lead). The topic of providing support on the #Marketing Slack Channel was brought up by @bridgetwillard for WordCamp Contributor Days. WC Bangkok is this weekend and @bridgetwillard will be on Slack from 6:30pm to 8:30 PST. A volunteer is needed to cover the WC Prague time period. @bridgetwillard updated the card with @newyorkerlaura’s notes, as she was unable to add them previously. @jeremyfremont shared the videos with @jenblogs4u – they are reviewing the videos and suggesting edits this week. @jenblogs4u will upload them to Cemal before next week’s meeting with documentation on what we feel should be done to create the initial videos. The artwork was completed by @dotrex and the post was published today. @bridgetwillard suggested we provide edits to the current handbook and make a checklist/onboarding doc to print for WC Organizers to use at their contribution day. Both @mcdwayne and @bridgetwillard expressed interest in working on the task, so we decided to move it to the todo list, and get it prepped with sub tasks and timeline expectations. @bridgetwillard mentioned chatting with #a11y and @postphotos about recruiting volunteers and wanted to have us keep it in mind. She also had a conversation with @tashan about TV as well regarding some of the other teams needing assistance. @mcdwayne mentioned that outreach would be central to our cards helping other teams organize marketing and copy for their projects. @harryjackson asked if we should be reaching out to other teams, or wait for them to ask for assistance? @mcdwayne mentioned it was the idea behind the ambassador card @jasonpknill started at WCUS. @mcdwayne mentioned we will pick the idea back up next meeting, and the team agreed with the idea. At close, @mcdwayne urged all to reach out if direction was needed, or grab a card and begin working. This week we focused on updates for the various cards under In Progress, as well as the To Do list. Looking for a Way to Contribute to WordPress? We began the meeting by announcing @jenblogs4u and @bridgetwillard were able to get the blog post published to promote Make WordPress. @mcdwayne urged other members to add to their social media queue for promotion, there was some discussion about the Twitter Card not previewing properly, and @bridgetwillard is working on getting that corrected. We began the meeting by reviewing the In Progress Cards. @bridgetwillard pinged design to get a featured image for this post, and will review, and publish. @harryjackson1221 has began working on the second case study to format current copy correlating to the survey answers and will be working on fleshing out copy in the coming week. This task is in process of being broken up into smaller tasks and @harryjackson1221 has created cards for each task in the to do list. He created a checklist that corresponds, so we can use the main card for viewing the progress of this task as a whole. @mcdwayne and @gidgey discussed getting the attendance list from WCABQ Contributor day to add their badges. Recap published. @miker updated the card with information on the progress he is making for the end user personas, that he will be interviewing 20 different users. He also gave a timeline update, stating the process is beginning and he will share the personas when it is complete. @mcdwayne moved this card back to In Progress. @bridgetwillard advised the team that @jenblogs4u emailed @jeremyfremont about it last night. They are working with @tashan and he mentioned they will be taking care of the editing for the videos. Jeremy will be uploading the videos soon. @miker wanted information about our vision with this project and @bridgetwillard updated the card with the description. This card was moved to the Backlog list in the meantime while we are waiting on an update. @mcdwayne discussed this was a project that was started by Started by @Pfunder, and @bridgetwillard asked @jaymanpandya to assist; @jaymanpandya is going to work on this but is en route to WC Udaipur. So it probably needs a few weeks. @bridgetwillard is going to chat with @AndreaMiddleton about Contributor Days and how we can be more prepared as a team, but it is not yet a card. @skarjune mentioned an instance where a WC organizer held a contributor day last year, but did not promote it, helping to justify the word needed here. As a team, we decided to archive this card, since we no longer meet in subgroups. This is the first card to be archived since we began using Trello last June. You do not need anyone else to give you a card. We are all 100% volunteers here. The cards are to help us communicate and keep momentum on our work as a team and track deliverables. You are all empowered to bring up things you want to do and own them and work them to make the change you want to see in the community! 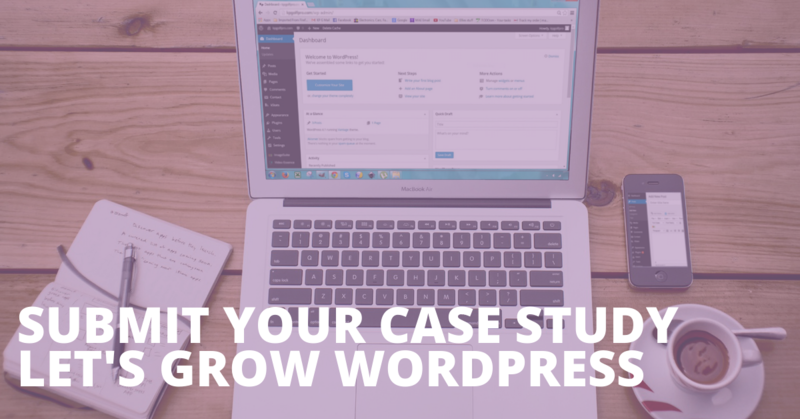 Submit your case studies in this simple survey. We want to understand how WordPress as a CMS is used, and we’d love your help to do it. Putting case studies together is not easy work. It’s difficult to find the right words to explain a complex project and do it in a way that others find interesting to read. The Make WordPress Marketing Team would like to help! And in turn, we’d love you to help us. In our survey, we’ve created a format to help you tell your story, so you don’t have to worry about writing huge chunks of text. You can simply use this framework and get them done quickly and effectively, whilst still telling the project story in full. It’s also a great opportunity for you to showcase your most interesting projects and clients.